Sudoku friends, this one's for you. 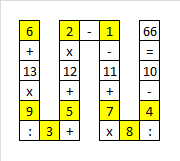 This maths puzzle was set for eight-year-old students in Bao Loc, Vietnam, and they have actually been able to solve the puzzle. Even some people with doctorate in mathematics have been stumped. Nobody in France nor Belgium has been able to solve this to date. Let us try. 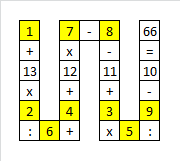 You just need to fill in each of the digits from 1 to 9 so that the grid makes sense. It is unknown if we can use the digits once only or as much as necessary. I spent several minutes trying to find a common or hidden pattern, and eventually noticed that in the third row of the grid the numbers are in descending order: 13, 12, 11, 10. Now, their sum is 46, and the only number written in the first row is 66. Would a similar pattern to 66, 46, 26... help in something? It looks like it can help with something, but this would perhaps work if there were not the 1 to 9 number limit, as $X+Y-Z$ cannot result to $71$ (being replace with digits from 1 to 9). And I follow the regular order of operations (first multiplications, then sums). Assuming that the result of any operation is integer (8 year old children usually don't know reals, do they? ), A+13*B/C implies that C divides (13*B), so C divides B. This excludes many solutions, leaving us with (9,1),(9,3),(8,4),(8,2),(8,1),(7,1),(6,1),(6,2),(6,3),(5,1),(4,1),(4,2),(3,1),(2,1) instead of 72 couples for B and C! Anyway, there are many different valid combinations that fit this problem, I could write a program that does the heavy work for us, but what would the point of it? 8 year old children don't have C++! Or maybe they have, since they're asians (joking, of course)? Time for the brute force computing brigade to pick up the remaining solutions. If we drop either of these assumptions, then this answer would be about 100 times longer.